#1351 Link to this post, but load the entire thread. February 26th, 2019 (12:33 AM). Congratulations Chaos Rush (hacksrepairman too I guess) on winning Hack of the Year 2018! #1352 Link to this post, but load the entire thread. February 26th, 2019 (9:02 AM). Edited February 26th, 2019 by Shrey2002. I've never played this hack before but I've decided to give this a try. #1353 Link to this post, but load the entire thread. February 27th, 2019 (12:06 AM). congratulations Chaos Rush and hacksrepairman!! played this game a few months ago and for some reason, i can't remember my team anymore. 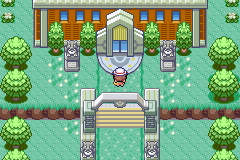 i remember loving the revamped Kanto experience. well-deserved! #1354 Link to this post, but load the entire thread. March 2nd, 2019 (6:57 AM). 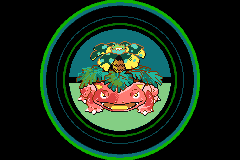 I love this Kanto Remake with all my heart. 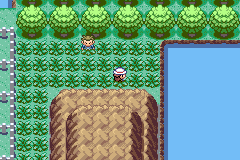 There should be another Rom Hack that is JUST LIKE this one but with an afterstory that takes place in Johto. It’s the number one hack that I wish existed. But either way, love Dark Violet, and of there’s anything that I demand, it would be hearing the whole OST on YouTube. #1355 Link to this post, but load the entire thread. March 2nd, 2019 (11:27 PM). Edited March 8th, 2019 by Shrey2002. Just finished playing this amazing hack!!!! I loved the story and the characters too. 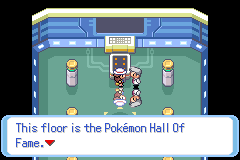 Edit: Finally for the first time in my life I completed my pokedex!!!! #1356 Link to this post, but load the entire thread. March 5th, 2019 (4:28 AM). #1357 Link to this post, but load the entire thread. March 7th, 2019 (3:27 PM). Was this the guide you were looking for? #1358 Link to this post, but load the entire thread. March 8th, 2019 (8:31 PM). #1359 Link to this post, but load the entire thread. 4 Weeks Ago (10:07 AM). 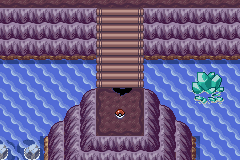 I was just walking on route 9 , walked against a wall and it jumped down into it like it was a ledge , and now im stuck inside the rock , its right by a bug trainer in a corner between 2 stairs. #1360 Link to this post, but load the entire thread. 3 Weeks Ago (6:22 AM). #1361 Link to this post, but load the entire thread. 3 Weeks Ago (2:29 PM). Edited 3 Weeks Ago by timster. This is a fantastic game that I was sadden when I heard it was cancelled but glad that it was picked back up and completed. 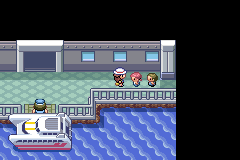 This is what Pokemon Fire Red and Leaf Green should've been but failed at in many aspects. I love the incorporation of all the main characters, Red, Blue, & Green. The story was well written. A lot of questions were answered in this game that the original games lacked. 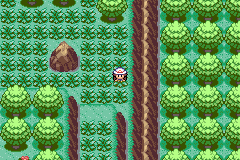 It provided a connection to the Johto pokemon games which is a crucial part to the story if you continue on to play in the Johto region. The mapping was great. 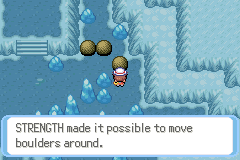 I love how the caves that usually cause me to quit a pokemon game were shorten. That made this game more enjoyable to me. 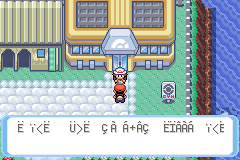 I definitely recommend this game hack to all, especially to those who enjoyed the Kanto region. #1362 Link to this post, but load the entire thread. 2 Weeks Ago (8:40 PM). Just started playing on Friday and I love it, I did play the previous version in 2014 and I loved it, but this one is much better. 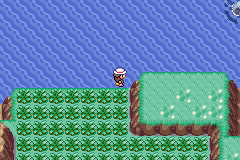 Currently in Vermilion City, hoping to jump back in later on. #1363 Link to this post, but load the entire thread. 1 Week Ago (2:18 AM). Can anyone list out all the custom moves in this game eg. Draco Bullet, Osmosis and the Special Poison version of Outrage? Does Nidoking get that move as well? #1364 Link to this post, but load the entire thread. 1 Week Ago (8:46 PM). I just wanted to say (I know it's late) congratulations on Hack of the year. You truly deserve it man. I'm actually thinking of trying this hack in the future. Good job man. #1365 Link to this post, but load the entire thread. 1 Week Ago (10:32 PM). Congratulations! Chaos Rush. I'm so happy to see one of my favorite hacks have won. Also, nice touch with Celadon Hotel. This guy in Fuchsia City uses a bunch of all caps WORDS in his dialogue. 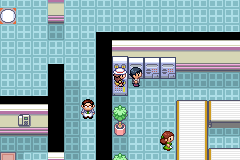 One of the machines in Silph Co. can be walked through. 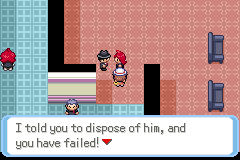 Giovanni uses the wrong pronoun when referring to a female character. 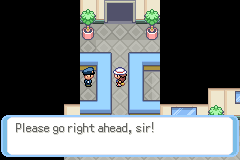 Cinnabar Island npc still has dialogue about multiplayer features that were removed. 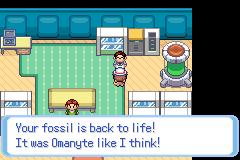 Dialogue suddenly becomes colored when restoring a fossil. 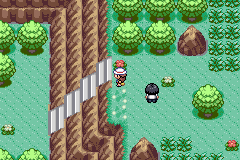 Nothing happens when you try to talk to the guard between Fuchsia and Route 19. You shouldn't be able to walk here. After beating Blaine, Red's dialogue is normal, except when you think he's done talking, it goes crazy. 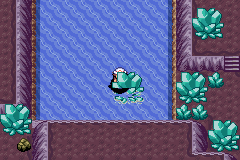 You sort of clip through objects in Cerulean Cave. 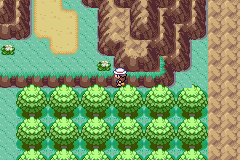 The two tiles to the right of the player can't be walked on. 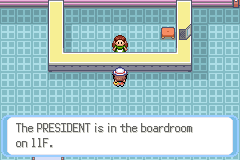 The Pokemon League's doors don't open. You just phase through them. The door of other buildings open. You can't reach the kid on the right in Vermillion City to talk to them. 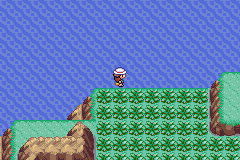 Battle Zone: you can't walk on the row of grass below me. There's no apparent way to reach this item. But I got it anyway, since you can to walk off the northern cliff. 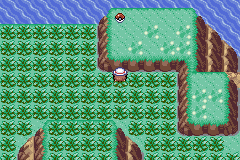 The entire row of tiles above the island can be walked on from the island. 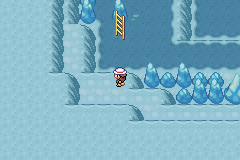 All the east-west staircases in the Battle Zone look like this. Each is one tile off from the ones next to it, so you have to zigzag down the stairs instead of walking straight up and down like you can for any other long staircase. Shouldn't be able to walk here. I caught both Heatran and Deoxys with one ultra ball, which would be pretty damn unlikely if they both had catch rates of 3. Blaine talked about how having his badge would increase the special stats of your pokemon. 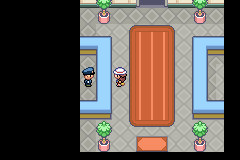 I don't remember the other gym leaders talking about it, and the guy in Cerulean who talks about the badges is gone, so I assumed that mechanic was removed in this hack. 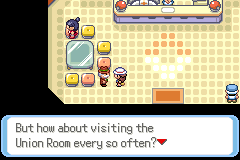 I haven't gone back to the other gym leaders to be sure though. To fix these, I'll have to rewrite the whole script(or completely change the maps/tiles), that may cause some new glitches(Even the chance is slim), I don't think it's worth it, so I decided to leave them alone. As for the Flash Cannon glitch, it only happens when you play the game with Mgba and real consoles. I know, it's pretty annoying, I mean, why a rom hack can't be played on real consoles? It makes no sense. So, I have made a small patch to get rid of the broken Flash Cannon animation, I'm sure many people will need it. I hope what I'm doing now can make more people know how good this hack is. #1366 Link to this post, but load the entire thread. 3 Days Ago (2:54 AM). #1367 Link to this post, but load the entire thread. 3 Days Ago (7:09 AM). One of my favorite hacks Chaos Rush and thanks hacksrepairman for the fixed version! #1368 Link to this post, but load the entire thread. 2 Days Ago (6:03 PM). I am surprised that very few people ask this and the very few that do don't seem to get answered. Is there is a list of the new pokemon learnset in the game? 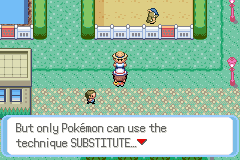 No one likes to waste TMs on pokemon who will eventually learn the same move through leveling up. Is there a list of some sorts? The only list provided is the evolution list.